contain alcohol flavored by distillation and amounting to at least 20% of the ouzo’s alcoholic strength. have an alcoholic strength of no less than 55% vol and no more than 80% vol. When the final product is yielded exclusively by distillation, it must be labeled as “100% distilled”. Last, the ouzo produced must be colorless and have a sugar content of 50 grams or less per liter. Tsipouro may also be flavored with aniseed but its label must clearly state that it is “aniseed-flavored tsipouro”. The production process begins with the preparation of the distillate which, according to the pertinent legislation, must represent at least 20% of the final ouzo produced. The following ingredients are added to the trunk of the pot still which, in traditional stills, is called kazani (pot or cauldron) and, in modern ones, is known as the boiler or boiling chamber: (a) 96°–100° alcohol produced from agricultural products; (b) water; and (c) flavoring agents, which may be, among others: aniseed, fennel, star anise, Chios mastic, cinnamon, coriander, peppermint, ginger, cardamom (aka kakoulés), angelica root, cloves, linden, and more. The liquid mixture is heated until it reaches 80°C, the temperature at which distillation starts. The steam produced from the distillation is channeled via the lyne arm to the condenser. The condenser of early pot stills used to be a tube of equal diameter to the lyne arm. As to its length, that varied and was determined by the technique favored by each distiller. Today, the condenser consists of vertical columns surrounded by cold water which circulates and allows the steam to cool down and liquefy. The distillation process lasts quite a while (an approximate 12 hours using a 1,000-liter still) with condensation of the steam resulting in an aromatic alcoholic distillate of approximately 80 ABV. The distillate produced at the beginning and end of the distillation process is respectively called “heads” and “tails” and is usually removed to avoid ending up with too strong a flavor. Those first and last quantities of distillate are usually added back to the mixture and redistilled. The result of the second distillation can also be used to produce ouzo of a different quality. 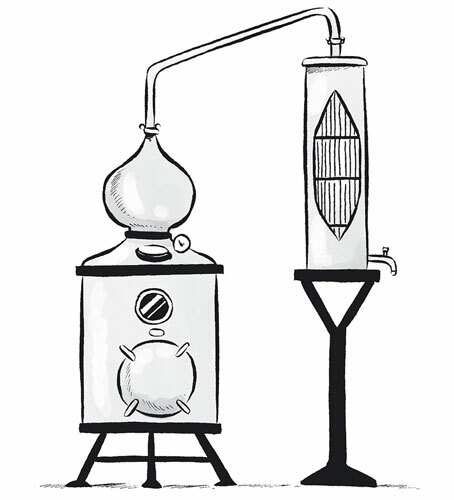 Some distillers apply the double distillation technique to differentiate their product from others. To produce “100% distilled ouzo”, distillers add water to their distillate, until the distillate reaches the desired alcoholic strength. However, for the majority of distillers who do not make their ouzo exclusively from distillate there is an intermediate stage. During that stage, anethole extract is added to a specific quantity of alcohol. To that mixture, the distillers add their own distilled product and, by slowly thinning it with water, they succeed in reaching the alcoholic strength they desire their product to have. During that intermediate stage, some distillers –to be found mostly in Southern Greece- add a small quantity of sugar diluted in water. The liquids are then homogenized in mixers and the end result is stored in special tanks for a specific period of time. Just like wine, ouzo undergoes clarification through filtration before the bottling process. Why does ouzo turn white when mixed with water? The essential oils of aniseed (anethole) that lend ouzo their intoxicating aroma dissolve easily in pure ouzo which has a high alcoholic content. By mixing ouzo with water or pouring it over ice, the alcoholic strength of ouzo abates and the essential oils can no longer dissolve, causing ouzo to turn an opaque milky color (“louche” called “galanada” or “galaniasma” in Greek). What’s more, adding water to ouzo releases the heavenly aroma of aniseed which floats out of the glass to stimulate our senses.